My pick for Android app of the year in 2012 was AirDroid because it is so darn useful. The software lets you move files wirelessly between an Android device and a computer, helps you manage photos, ringtones and music and allows you to send texts through your computer by sending them through an connected phone. If the final version of AirDroid 3 looks anything like the current beta edition, AirDroid 3 might end up on my best app list this year again. All of the back-and-forth data sent between an AirDroid desktop client and the AirDroid Android app are encrypted from end-to-end with the beta. You can still reply to incoming SMS messages from the computer using AirDroid 3, both for individual conversations and group texts. All of your phone or tablet notifications can be pushed to the computer, although you can silence these completely or at the app level. 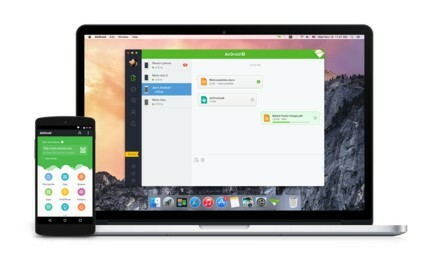 Incoming call alerts are close to what Apple offers with iOS 8 and OS X Yosemite but with a catch in AirDroid 3: If you decide to accept a call, the conversation still takes place on your phone; not on the computer. I suspect the AirDroid team is working on that function through the computer. If you’re not sure that the beta of AirDroid 3 is for you, this video demonstration walk-through of the app might help you decide. Even though the focus of this beta is on computer clients, AirDroid has long worked through a web browser and will still continue to do so, the company says. Good to see android come to the party a few years late.